Three explosions blamed on the Nigerian armed group Boko Haram have killed, on Saturday 10/10/2015. 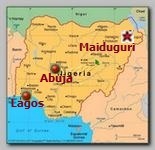 at least 37 people in a Chadian city on the shores of Lake Chad, security sources have said. Although Boho Haran suffered a major setback after the Battle in Sambissa Forest, at the end of 04/2015, it is obvious that like Al Qaeda, the Taliban , al-Shabab or I.S.I.S – Boko Haram is just reinventing itself and change its configuration .